…you got it! Many of you said you appreciate seeing quick and easy weeknight meals here, so I’ll be bringing you more. They’re going to become more of a necessity for me anyway so I’m happy to oblige! One thing’s for sure – you definitely don’t have to sacrifice taste when you’re taking shortcuts. Fresh vegetables and seasonings are great to pair with a convenience product like frozen ravioli. 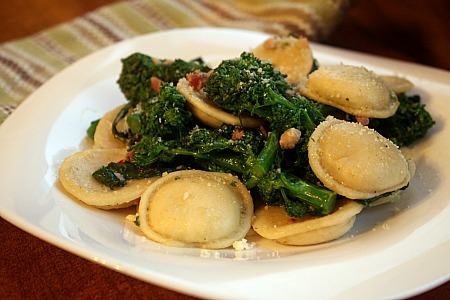 For this particular dish, I used a favorite in this house – broccoli rabe. If you haven’t tried it, please do. Don’t be afraid of its bitterness…although if it really is too much for you, boil it before sauteing. You will have this meal on the table in the amount of time it takes to cook the ravioli. Quick, easy, delicious. The perfect weeknight slogan! Cook ravioli according to package directions. Meanwhile, heat oil in a large deep skillet over medium high heat. Add garlic, pancetta and crushed red pepper. Put broccoli rabe in carefully and move with tongs until it begins to reduce (it will shrink a lot). Cook down until soft. Turn heat down to low. Drain ravioli and add to skillet. Add salt and pepper to taste. Mix everything together until ravioli are coated with all ingredients. Add cheese, toss quickly and serve. 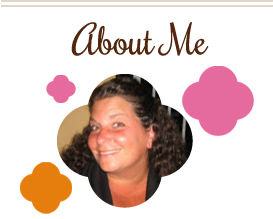 This entry was posted in broccoli rabe, Italian, main dishes, pasta, pork, QuickAndEasy. Bookmark the permalink. Gorgeous – quick midweek feasts are grand- and brocolli rabe is one of my favourites (sometimes to blanch some of the bitterness out I dunk it for a minute in the pasta water with the noodles). I love broccoli rabe at restaurants, but I’ve never made it at home. Gonna have to try this. Thanks for linking up at A Little Nosh this week!